The World of Philosophy series is a dramatic presentation, in understandable language, of the concerns, questions, interests, and overall outlook of the world's great philosophers and philosophical traditions. Special emphasis on clear and relevant explanations gives you a new arsenal of insights toward living a better life. The value of the book lies in fact that author not only recognises Maimonides great influence on philosophy and science, but also stresses his importance for religious studies. From the book one gets conviction that Maimonides was genius in bringing together science and religion - in such a way, that nor science nor religion looses anything from their values.Even more, Prof. Idit stresses his top importance, lasting for more than 800 years now, for both philosophy and for Judaism. The book has also interesting thread about Maimonides intellectual dialog with 200 years earlier Rabbi Saadia (Rabbi Se`adiah ben Yosef Gaon). The dialog of admiration, but also, on the level of philosophical debate - the dialog of disagreement with his philosophy which was close to Kalam philosophy. What would have made Maimonides and Medieval Jewish Philosophy better? I am familiar with the pronunciations used to describe these issues in British English, American English and Australian English. None of them have the quite wacky pronunciations used for some of the Hebrew terms used in this reading. It was very distracting, as the reader seem to 'Frenchify' the pronunciation. Could no one be found familiar with the pronunciations? What could Idit Dobbs-Weinstein have done to make this a more enjoyable book for you? The content itself was OK.
What didn’t you like about Lynn Redgrave’s performance? See above - she was obviously unfamiliar with the material. I gave up half way through. It was annoying, because there is nothing of equivalent length on audible. It would be good if there could have been biographical information on the audible site about the author. Yes. 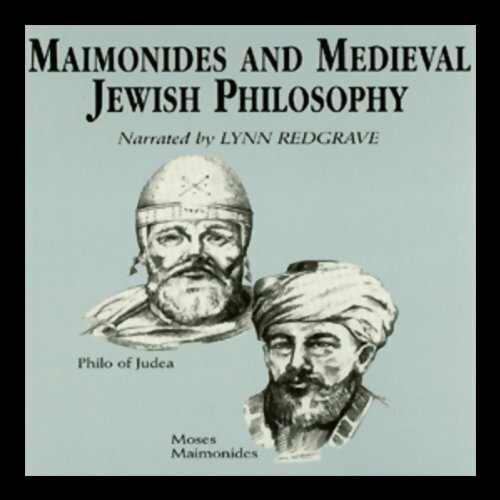 I recently purchased the Negative & Positive Commentaries of Maimonides rand I think this is a good book to listen to or read before reading those. They give you an understanding of the objective of the writings in a general sense. Good for someone who is interested in the study of philosophy and/or Judaism. I wished it would have touched on history a little more. It starts out that way, but toward the end, it gets purely philosophical. I don't mind that because I also have an appreciation for philosophy, but for the individual who is seeking a prose aiming toward history, this may not be ideal. When it said that we can only attain our own unique understanding of Divinity. Also, when it deals with the world being eternal and creation; etc. I also liked the part pertaining to the Preface when Maimonides addresses the acquirement of knowledge and how it should not be an accidental experience, else it can be faulty. Good point. The points made here are quite in-depth. A decent overview of bigger issue. Personally fascinated by the deist / scholastic divide in religious thought, which is what this really boils down to. Not a fan of Lynn Redgrave though. Sorry Lynn.